Todd Baxter is a 30-year veteran of law enforcement, with 22 years of service to the Rochester Police Department and four years experience as Chief of Police in the Greece Police Department. Sheriff Baxter joined the local force following three years of active duty with the U.S. Army as a Military Police Officer. He continued his military service with the U.S. Army Reserve, 98th Division, for another 19 years before retiring as a Master Sergeant, Brigade Anti-Terrorism and Training Non-commissioned Officer in 2005. Within the Rochester Police Department, Baxter commanded a Division consisting of officers, investigators and supervisors in five platoons, non-sworn employees, and managed a new police facility. Baxter served as the Administrative Aide to three Chiefs of Police in an organization consisting of 893 sworn and non-sworn employees. Baxter was a 19 year member of the SWAT team, completing his assignment as team Commander. Tapped to lead local law enforcement through a period of transition in Greece, Baxter took over what was once the most embattled police force in the U.S. Baxter has been praised for his efforts in creating initiatives of public and private partnership, and his focus on the ethical responsibility and professional development of his team. He reorganized the department with a bilateral checks and balance system that required accountability from all levels of the organization. In April 2014, Baxter assumed the duties of Executive Director of the Veterans Outreach Center, Inc., the oldest, local, non-profit, taking care of veterans. He recognized the role family wellness plays in supporting the overall success of an individual, and is proud to have helped produce financial stability and programs that serve the region's 68,000 veterans and their families. 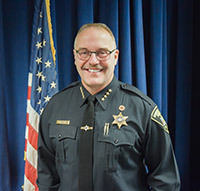 Elected to Monroe County Sheriff in November 2017 by nearly 57% of the vote, Baxter holds an Associate Degree in Criminal Justice from Monroe Community College, a Bachelor’s Degree in Organizational Management and a Master’s Degree in Strategic Leadership from Roberts Wesleyan College. He also teaches at Roberts Wesleyan. Todd is married to Mary Baxter. They have two sons, Kevin and Zachary.